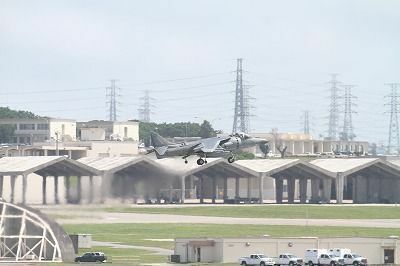 An AV-8 Harrier jet at Kadena Air Base in 2012. A U.S. Marines AV-8 Harrier jet went down in the ocean off Okinawa after taking off from U.S. Kadena Air Base on the afternoon of September 22. According to the U.S. military, the pilot was safe and the Nakagusuku branch of the Japan Coast Guard dispatched rescue officers. Around 2:58 p.m., HH-60 helicopters were confirmed to have taken off from Kadena Air Base. The Harrier jet belonging to U.S. base which had flown to Kadena base from Marine Corps Air Station Iwakuni, crashed in the ocean off Okinawa. The 11th Regional Coast Guard Headquarters announced that an airplane belonging to the U.S. military appeared to have crashed about 150 kilometers east of Cape Hedo. The U.S. military called for the Coast Guard to rescue the pilot. The Coast Guard dispatched a patrol boat and an airplane for the rescue mission. The pilot was reported to have ejected safely from his aircraft. The crashed U.S jet flew to Kadena Air Base from Iwakuni Base this August and had been training in Okinawa.